When it comes to restaurant insurance, most agents think of traditional businesses – cafes, restaurants, fast food chains, bars etc. 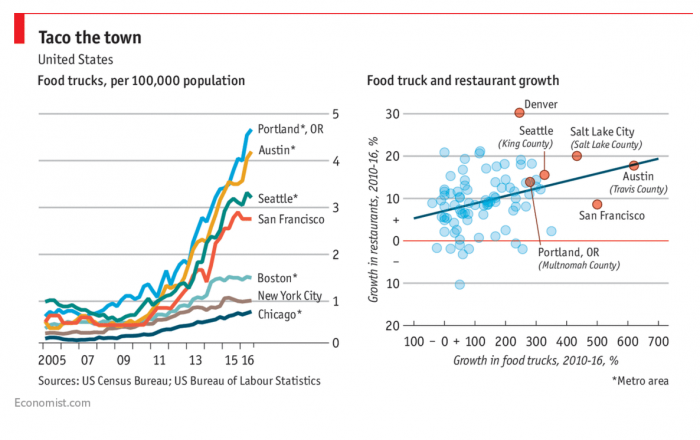 However, there is one niche that is underserved – the humble food truck operator. Many types of people, from professional chefs to hobby cooks, are getting their feet wet in the competitive restaurant industry by starting their own food trucks. Indeed, compared to paying expensive rent and utilities on a restaurant location, these on-the-go purveyors of delicious eats save so much on overhead.However, along with these advantages come many challenges, particularly when it comes to their small business insurance needs. So many would-be food truck vendors have so many questions, which is a great opportunity for insurance agents to diversify their book of business and add food truck insurance to their lineup. .
Why Should I Market to Food Truck Vendors? If you’ve read this far into this post, then the first question you probably have on your mind is “why should I even bother to market to food truck vendors?” Indeed, are there even enough food trucks out there? Food trucks are here, and they are here to stay. After all, for many busy people, they are the best way to get healthy, fresh, and delicious food to come to them. That means busy office workers don’t have to waste precious minutes of their lunch break driving out to a restaurant. Or busy moms and dads can pick up a meal around the corner from their office or home and spend more time at home enjoying their food, rather than making it. If you live in a city that has a good food truck presence, then chances are, there will be more of these mobile kitchens in the coming years. And if you don’t, you may just have to bide your time as pretty soon, you’ll be seeing them everywhere. In fact, just this last summer, everywhere my wife and I went on vacation, we saw food trucks! We saw them at fairs and events in our city, traveling around the country, and even going out on a nice day for a walk. Food trucks aren’t just selling ice cream and treats anymore, either. We saw trucks selling tacos, coffee, sandwiches and food from all over the world! What Types of Insurance Can I Offer Food Truck Vendors? So now, you may be asking yourself, what types of insurance do food truck vendors need? At times, it seems confusing – is it a restaurant? A truck? A kitchen? When you think about it, a food truck is ALL those things. That’s why offering insurance for food truck vendors should be a no-brainer! You can instantly sell several types of insurance to a single vendor. That’s because they need to insure a vehicle, a business, AND employees. Also don’t forget their home, personal auto(s), life insurance needs, and the list goes on, right? Of course, the types of insurance varies depending on local laws, so make sure you research what’s fully legal and compliant with local regulations as well as your carrier’s requirements before building out this line. .
Commercial Vehicle / Auto Liability Insurance – this should cover the damage to the truck itself, but not necessarily the kitchen area. This is necessary in case of auto accidents. Workers’Comp Insurance – covers medical bills in case employees get injured. This may even include family or friends who are only helping out and not employed by the business. General Commercial Liability Insurance – protects owners if they get sued if they cause physical damage or injury, or other things like copyright infringement or false advertising. Again, these are just the basics, and local laws may vary. Many food truck owners may not even know what type of insurance they need, and if your team doesthe necessary legwork, you can help them find out more. Of course, if you really want your customers to be protected, you may want to offer an umbrella policy as an add-on to existing policies, which can increase coverage and cover exceptional circumstances. If anything, this may help your customer sleep better at night, knowing they are covered for any eventuality. How Can I Get in Front of Food Truck Vendors? 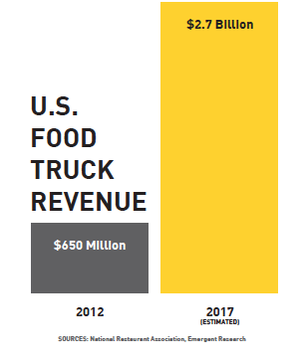 Okay, so now that you know why you should sell insurance to food trucks and which types, how do you go about getting your foot in the (truck) door? B2B marketing often involves a lot of face-to-face interaction. You can’t just advertise on the radio or TV and hope that food truck vendors see your ads. One of the best ways to find customers is by going to where they are – simply, approach food truck vendors where they hang out. Of course, you don’t want to sell to them while they are busy slinging their fare to hungry customers (that’s just asking for trouble!). You might want to approach them at the end of the busy shifts and offer your services. While they may already have coverage, they might be expanding their business and thus need additional insurance. If anything, you might end up getting fortunate or have extremely good timing – perhaps the owner is not satisfied with his or her current provider and is looking to switch. Or they may know someone who is starting out and looking to get coverage and offer to refer you. If you live in cities where they host lots of conventions, you might get a food truck convention near you. Organizations like ROAM and the National Food Truck Association host a variety of events throughout the year. You might be able to get in as a vendor, attendee, or even as a speaker or resource person, and get in front of hundreds of food truck owners in one day. Of course, you may not have time to do all these things, especially if you’re busy at the office. There is one way you can be available to potential food truck customers, and that is through social media. A social media presence is important these days, and no one knows it better than food truck owners. Of course, it totally makes sense that a “mobile” business like a food truck would embrace another mobile technology. It used to be, food truck vendors would use Twitter or Facebook to tell customers where they were stationed for the day. However, over the years, it’s evolved into a full marketing machine for them. And that is why you should be on social media too! Your customers want to be able to relate to you and know you understand their business. Food truck vendors, especially, will want to ensure that you know what makes them different from regular restaurants. So, if you want to get more food truck insurance customers, how can you possibly stand out from other agents? Well, for one thing, you can start by being more informed and offering great service. Many people who want to start food trucks often don’t know the first thing about the business (though this is not true in all cases). However, their entrepreneurial spirit is spurning them on, and they dream of becoming a success. So, why not help them by offering your expertise? You can do your own research and ask other food truck owners those questions they asked when they first started. Next, food truck vendors, like any insurance customer, just want one basic thing: good service and a partner they can rely on. They want to know that you will be there for them, to help them and guide them, as they go on their journey. Having a partner can help ease their burden and ensure success in their endeavors.